Posted by Torch Staff on March 30, 2019 in Tire Fire. CORRECTION: The name of a source has since been changed. 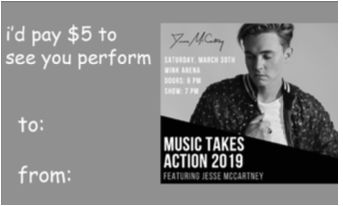 Music Takes Action might sound a little different this year as headliner Jesse McCartney commands the stage. According to Entertainment Unlimited (EU) President Jessica McDonald, McCartney has agreed to play his hit songs “Beautiful Soul” and “Leavin’” on a constant loop during his 90-minute set. Both songs span about three minutes and 30 seconds, meaning that this year’s MTA crowd should be able to enjoy each song about 13 times during the set. The change in performance schedule has created a lot of excitement around campus and the remaining tickets for the show sold out within hours of the announcement. “‘Beautiful Soul’ came out when I was six in 2004 and it’s just really exciting that I’ll get to hear it 13 times. It’s so nostalgic. It brings back so many good memories of listening with my parents in the car before the divorce and listening with my parents at home before the divorce. I’m really excited,” Ferris psychology senior Tara Pautry said. For some students, the altered song itinerary didn’t alter their outlook on the concert. “It makes no difference to me. Me and my friends, we’re just going to see how drunk we can get before going. Last year three of us drank half a bottle of Popov, but this year there’s four of us so I’m thinking we’ll finish it,” Ferris HVAC junior Daniel Aimes said. A representative of McCartney was not immediately available for comment.